Adramatic revolution in the field of intervention cardiology has been heralded by the use drug-eluting stents (DES) replacing bare metal stents (BMS), and thereby significantly reducing the restenosis rates and the need for repeat revascularization. ,,, However, the occurrence of late-onset complications, such as stent thrombosis, has raised concern over the use of DES. In addition, there has been an increasing awareness of stent fracture (SF) as a potential complication following DES implantation. Review of the literature shows there is increasing concern about SF as a potential cause of stent restenosis and thrombosis, which can lead to adverse clinical outcomes such as recurrent angina, myocardial infarction (MI), and even sudden death. The objective of this article is to analyze controversial issues about the incidence, diagnostic tools, and clinical implications of SF. In 1964, Charles Theodore Dotter and Melvin P. Judkins described the first angioplasty. In 1977, Andreas Grüntzig, a German radiologist, successfully performed the first balloon coronary angioplasty,  a revolutionary treatment that led to the birth of interventional cardiology. Coronary stents were first developed in the mid-1980s,  and have ultimately replaced plain balloon angioplasty after the observed improvements in angiographic and clinical outcomes seen with their use. , Nowadays, different types of stents are used in daily practice, ranging from conventional BMS and old-generation DES to newer generations of DES: DES with novel coatings, dedicated bifurcation stents, self-expanding stents, and biodegradable stents. Coronary SF was first reported in 2002 after a BMS implantation in a venous bypass graft. The first case of coronary DES fracture appeared in 2004,  after which several cases of SFs were reported. The reported incidence of SF varies widely between different studies. These variations are related to many different factors including definition of SF among these studies, the methods used to detect SF, type of stent used, and the population studied. The majority of studies report the incidence of SF between 1 and 8% [Table 1]. The incidence also varies depending on the percentage of patients who undergo follow-up with the available imaging modalities with variable sensitivity of detection of SF. As SF might lead to stent thrombosis, several patients might present with sudden cardiac death before diagnosis. In an autopsy study, the incidence of SF was 29%, which is much higher than clinically reported. A high rate of adverse pathologic findings was observed in lesions with grade V SF, whereas fracture with grade I-IV did not have a significant impact on the pathological outcome [Figure 1]. Autopsy studies could be expected to have a higher incidence of SF compared to living patients as the studied population might have had a higher incidence of stent thrombosis and restenosis in which SF might be the cause, leading to a higher reported incidence of SF. Most cases of SF were reported with the use of sirolimus-eluting stent (SES). Several theories have been proposed to explain this association. Stent location: [Table 3] SF is more common in right coronary artery (RCA) and saphenous graft locations as these vessels are dynamic during cardiac contractions. Stents in these locations may be subjected to repetitive distorting forces, as some segments of these vessels have more flexion points during the cardiac cycle. , Repetitive cardiac contraction exposes the stent to compression, torsion, kinking, elongation, bending, and shear stress, , which can cause fracture from mechanical fatigue. The points of SFs are usually located at hinges  subjected to either medial or shear forces created by non-uniform vessel anatomy. In spite of its low reported incidence, SF represents an important clinical entity as it may present with serious clinical sequelae [Table 3]. It is important to mention that not all SFs are associated with clinical sequelae as it can be an incidental finding in asymptomatic patients, particularly with mild forms of SF (isolated strut fractures). SF can present as recurrent angina, MI, , and even sudden death. So, it is possible that some cases of sudden cardiac death in patients with previous stent implantation might be secondary to SF, leading to stent thrombosis. In a study by Lee et al.,  530 patients with DES underwent repeat angiography. SF was identified in 10 patients. None of these fractures were detectable at the time of stent placement. The median time interval from stent implantation to detection of fracture at repeat angiography was 226 days (ranging from 7 to 620 days). Six patients had binary restenosis and one patient had stent thrombosis, all necessitating repeat intervention. On routine follow-up coronary angiography 6-9 months after SES implantation, Ino et al.,  reported 33% in-stent binary restenosis, 28% target lesion revascularization (TLR), and 0% stent thrombosis rates in SF lesions. All patients with SF had an additional follow-up for 24 months, but no major adverse coronary events were observed. In a literature review by Chhatriwalla et al.,  a total of 289 SFs, with available information about patient presentation, were found. 10.4% of cases presented with ST segment elevation myocardial infarction [STEMI] or stent thrombosis and 26.3% presented with Non ST segment elevation myocardial infarction [NSTEMI] or Unstable angina [UA]. The review also highlighted the difference in clinical presentation between patients with DES fracture and patients with BMS fractures, and it was noticed that STEMI occurred more often in patients in the first group, indicating that the latter has more benign presentation. This might be explained by the thicker neointimal layer that develops around the BMS, which limits the contact of stent material with the arterial lumen inhibiting thrombus formation. In case of DES, because of the absence of this thick neointimal layer, fractures allow the stent's metal structure to come into contact with the vessel lumen, leading to thrombus formation. In a study by Park et al.,  the clinical presentation of patients with SF did not differ from those without SF, including the severity of angina, the incidence of Acute coronary syndrome [ACS], and event silent ischemia. Despite that, it is important to mention that in this study, 50% of SFs were of type 1, and overall, types 1, 2, and 3 represented 96.1% of all cases, while type 4 represented only 3.9% and there were no type 5 fractures. It is expected that the majority of these patients will have similar outcomes compared to patients without fracture, as the adverse clinical outcome in SF is associated with severe forms. It is worth mentioning that the rate of binary stenosis, as well as target lesion revascularization, was significantly higher in the SF group compared to the control group (41.7% vs. 11.4% and 33.3% vs. 8.1%, respectively). An interesting finding in a study by Ino et al.,  is that late stenosis was not observed in SF sites without early restenosis during the midterm follow-up after SES implantation. Jindal et al.,  reported a case of giant coronary aneurysm after Cypher implantation in a patient who presented with fever of unknown origin. Histopathology revealed a predominantly lymphocytic and eosinophilic infiltrate with an absence of giant cells, suggesting that local hypersensitivity reactions caused the aneurysm. There might also be association between SF, pseudoaneurysm, and infection. Kelvin S. H. Loke  reported a case of pseudoaneurysm and coronary abscess secondary to coronary SF identified with Tc-99m hexamethylpropyleneamine oxime-labeled white blood cell SPECT/CT scintigraphy. In several studies, IVUS was used to confirm the diagnosis of SF that was suggested by angiography. In other studies, IVUS detected several cases of SF that were missed by angiography. So, the use of IVUS increased the rate of SF detection in multiple studies. Yamada et al.,  in a prospective study of 102 Cypher stents with 100% angiographic and IVUS follow-up, observed three SFs (3%), all detected with IVUS but not observed on angiography. Another limitation of IVUS is the occasional difficulty in passing the IVUS across the lesion when there is SF, especially with stent displacement. Several cases of SF detected by MDCT have been reported [Figure 2]. ,, In a retrospective study, 18 SFs were detected by MDCT in 371 patients with 545 stents. Six SFs were not detected by initial conventional angiograms in this study. Pang et al.,  evaluated the ability of 64-slice computed tomography (CT), conventional cine-angiography, and IVUS to detect SFs under ideal conditions. They concluded that under ideal in vitro conditions, CT has a high accuracy when used to evaluate coronary SFs. The overall accuracy, sensitivity, and specificity of detecting SFs are lower with conventional cine-angiography. SFs were not detected using IVUS in this study, which was attributed to the limitations of acoustic window inherent to in vitro procedures and the longitudinal orientation of the fractures. Hecht et al.,  evaluated stent gaps in 292 consecutive patients with 613 stents. Correlations with catheter coronary angiography (CCA) were available in 143 patients with 384 stents. The authors concluded that stent gap by CT angiography [CTA] is associated with 28% of ISR, and ISR is found in 46% of stent gaps. They also noted that stent gap is infrequently seen on catheter angiography, and most likely represents SF in the setting of a single stent and may represent SF or overlap failure in overlapping stents. This imaging modality can also be used to detect SF [Figure 3]. In a study by Kashiwagi et al.,  it was found that the absence of stent strut was the most common morphological feature of SF in OCT. It was also noticed that both the mean and maximal neointimal area were larger in the SF group and the distribution of neointimal area showed a peak at the fracture site in the fractured stent group. There is no consensus about the ideal management of SFs. The decision should depend on the type of fracture, presence of ischemia, and the presence of factors that predict possible recurrence. If the reason of SF was stent overexpansion, then restenting the lesion again is possible with avoidance of stent overexpansion. On the other hand, when SF is caused by a non-modifiable factor like excessive vessel tortuosity, then referring the patient for CABG is more reasonable when there is a clear need for revascularization. SF represents an important clinical entity which is most likely underestimated. Clinical presentation ranges from an incidental finding in an asymptomatic patient to a presentation of recurrent angina, MI, and even sudden death. Factors such as right coronary artery and saphenous graft stenting, lesion angulations, long stents, and the use of DES are all associated with increased prevalence of SF. There is no consensus on the best diagnostic imaging modality for detection of SFs, but it is well recognized that conventional angiography is not sufficiently sensitive for this purpose. Multiple imaging modalities can be used, including IVUS, stent boost, MDCT, and OCT.
Management of SF should be individualized depending on the presence of ischemic signs and symptoms, the presence of predictors of recurrence, the type of stent and the type of fracture, and the available techniques. Further studies with frequent clinical follow-up and using different imaging modalities are needed for a better understanding of this entity. In the future, with better understanding of this condition, we might be able to create a scoring index depending on the presence of the predictors mentioned, in order to estimate the risk of SF before stenting or restenting. In addition, understanding this entity will also influence the future of stent design, intended to minimize the risk of SF in the future. 1. Shaikh F, Maddikunta R, Djelmami-Hani M, Solis J, Allaqaband S, Bajwa T. Stent fracture, an incidental finding or a significant marker of clinical in-stent restenosis? Catheter Cardiovasc Interv 2008;71:614-8. 2. Betriu A, Masotti M, Serra A, Alonso J, Fernandez-Aviles F, Gimeno F, et al. Randomized comparison of coronary stent implantation and balloon angioplasty in the treatment of de novo coronary artery lesions (START): A four-year follow-up. J Am Coll Cardiol 1999;34:1498-506. 3. Al Suwaidi J, Holmes DR Jr, Salam AM, Lennon R, Berger PB. Impact of coronary artery stents on mortality and nonfatal myocardial infarction: Meta-analysis of randomized trials comparing a strategy of routine stenting with that of balloon angioplasty. Am Heart J 2004;147:815-22. 4. Bae JH, Hyun DW, Kim KY, Yoon HJ, Nakamura S. Drug-eluting stent strut fracture as a cause of restenosis. Korean Circ J 2005;35:787-9. 5. Dotter CT, Judkins MP. Transluminal treatment of arteriosclerotic obstruction. Description of a new technic and a preliminary report of its application. Circulation 1964;30:654-70. 6. Gruntzig A. Transluminal dilatation of coronary-artery stenosis. Lancet 1978;1:263. 7. Sigwart U, Puel J, Mirkovitch V, Joffre F, Kappenberger L. Intravascular stents to prevent occlusion and restenosis after transluminal angioplasty. N Engl J Med 1987;316:701-6. 8. Gruntzig AR, Senning A, Siegenthaler WE. Nonoperative dilatation of coronary-artery stenosis: Percutaneous transluminal coronary angioplasty. N Engl J Med 1979;301:61-8. 9. de Feyter PJ, de Jaegere PP, Serruys PW. Incidence, predictors, and management of acute coronary occlusion after coronary angioplasty. Am Heart J 1994;127:643-51. 10. Chowdhury PS, Ramos RG. Coronary-stent fracture. N Engl J Med 2002;347:581. 11. Sianos G, Hofma S, Ligthart JM, Saia F, Hoye A, Lemos PA, et al. Stent fracture and restenosis in the drug-eluting stent era. Catheter Cardiovasc Interv 2004;61:111-6. 12. Alexopoulos D, Xanthopoulou I. Coronary Stent Fracture: How Frequent It Is? Does It Matter?. Hellenic J Cardiol 2011;52:1-5. 13. Brilakis ES, Maniu C, Wahl M, Barsness G. Unstable angina due to stent fracture. J Invasive Cardiol 2004;16:545. 14. Dorsch MF, Seidelin PH, Blackman DJ. Stent fracture and collapse in a saphenous vein graft causing occlusive restenosis. J Invasive Cardiol 2006;18:E137-9. 15. Kwon SU, Doh JH, Namgung J, Lee SY. 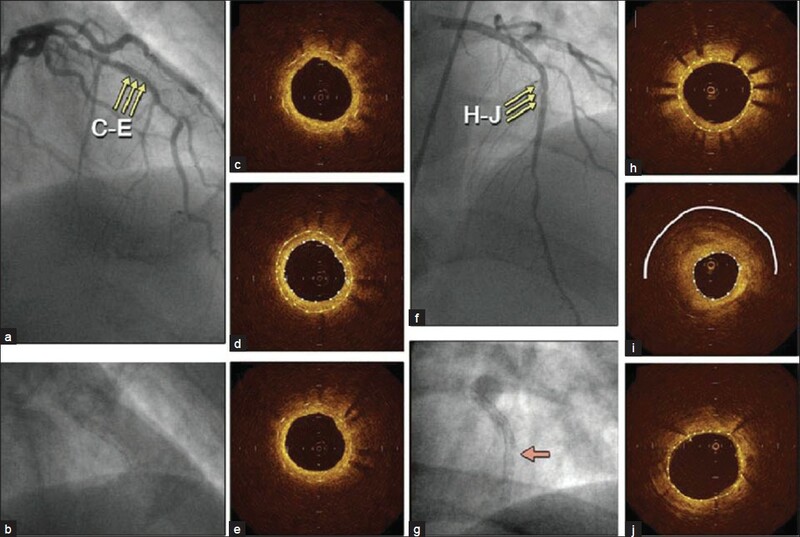 Stent strut fracture-induced restenosis in the right coronary artery: Detection by MDCT. Heart 2008;94:221. 16. Bilen E, Saatci Yasar A, Bilge M, Karakas F, Kirbas O, Ipek G. Acute coronary syndrome due to complete bare metal stent fracture in the right coronary artery. Int J Cardiol 2010;139:e44-6. 17. Lee SE, Jeong MH, Kim IS, Ko JS, Lee MG, Kang WY, et al. Clinical outcomes and optimal treatment for stent fracture after drug-eluting stent implantation. J Cardiol 2009;53:422-8. 18. Kim HS, Kim YH, Lee SW, Park DW, Lee CW, Hong MK, et al. Incidence and predictors of drug-eluting stent fractures in long coronary disease. Int J Cardiol 2009;133:354-8. 19. Hamilos MI, Papafaklis MI, Ligthart JM, Serruys PW, Sianos G. Stent fracture and restenosis of a paclitaxel-eluting stent. Hellenic J Cardiol 2005;46:439-42. 20. Smaldone C, Bacà M, Niccoli G. A case of early drug-eluting stent fracture. J Invasive Cardiol 2010;22:E186-8. 21. Wu MC, Cheng CC, Huang TY. Fracture of zotarolimus-eluting stent after implantation. Tex Heart Inst J 2009;36:618-20. 22. Park JS, Cho IH, Kim YJ. Stent fracture and restenosis after zotarolimus-eluting stent implantation. Int J Cardiol 2011;147:e29-31. 23. Lee MS, Jurewitz D, Aragon J, Forrester J, Makkar RR, Kar S. Stent fracture associated with drug-eluting stents: Clinical characteristics and implications. Catheter Cardiovasc Interv 2007;69:387-94. 24. Aoki J, Nakazawa G, Tanabe K, Hoye A, Yamamoto H, Nakayama T, et al. Incidence and clinical impact of coronary stent fracture after sirolimus-eluting stent implantation. Catheter Cardiovasc Interv 2007;69:380-6. 25. Umeda H, Gochi T, Iwase M, Izawa H, Shimizu T, Ishiki R, et al. Frequency, predictors and outcome of stent fracture after sirolimus-eluting stent implantation. Int J Cardiol 2009;133:321-6. 26. Nakazawa G, Finn AV, Vorpahl M, Ladich E, Kutys R, Balazs I, et al. Incidence and predictors of drug-eluting stent fracture in human coronary artery a pathologic analysis. J Am Coll Cardiol 2009;54:1924-31. 27. Popma JJ, Tiroch K, Almonacid A, Cohen S, Kandzari DE, Leon MB. A qualitative and quantitative angiographic analysis of stent fracture late following sirolimus-eluting stent implantation. Am J Cardiol 2009;103:923-9. 28. Ino Y, Toyoda Y, Tanaka A, Ishii S, Kusuyama Y, Kubo T, et al. Predictors and prognosis of stent fracture after sirolimus-eluting stent implantation. Circ J 2009;73:2036-41. 29. Kim HS, Kim YH, Lee SW, Park DW, Lee CW, Hong MK, et al. Long-DES-II Study Investigators. Incidence and predictors of drug-eluting stent fractures in long coronary disease. Int J Cardiol 2009;133:354-8. 30. Chung WS, Park CS, Seung KB, Kim PJ, Lee JM, Koo BK, et al. The incidence and clinical impact of stent strut fractures developed after drug-eluting stent implantation. Int J Cardiol 2008;125:325-31. 31. Lee SH, Park JS, Shin DG, Kim YJ, Hong GR, Kim W, et al. Frequency of stent fracture as a cause of coronary restenosis after sirolimus-eluting stent implantation. Am J Cardiol 2007;100:627-30. 32. Chhatriwalla AK, Unzek S, Kapadia SR. Recurrent Stent Fracture in the Right Coronary Artery. Clin Cardiol 2010;33:E70-2. 33. Leong DP, Dundon BK, Puri R, Yeend RA. Very late stent fracture associated with a sirolimus-eluting stent. Heart Lung Circ 2008;17:426-8. 34. Ramegowda RT, Chikkaswamy SB, Bharatha A, Radhakrishna J, Krishnanaik GM, Nanjappa MC, et al. Circumferential Stent Fracture. Novel detection and treatment with the use of stent boost. Tex Heart Inst J 2012;39:431-4. 35. Surmely JF, Kinoshita Y, Dash D, Matsubara T, Terashima M, Ehara M, et al. Stent strut Fracture-Induced restenosis in a bifurcation lesion treated with the crush stenting technique. Circ J 2006;70:936-8. 36. Schömig A, Dibra A, Windecker S, Mehilli J, Suárez de Lezo J, Kaiser C, et al. A meta-analysis of 16 randomized trials of sirolimus-eluting stents versus paclitaxel-eluting stents in patients with coronary artery disease. J Am Coll Cardiol 2007;50:1373-80. 37. Canan T, Lee MS. Drug-eluting stent fracture: Incidence, contributing factors, and clinical implications. Catheter Cardiovasc Interv 2010;75:237-45. 38. Doi H, Maehara A, Mintz GS, Tsujita K, Kubo T, Castellanos C, et al. Classification and Potential Mechanisms of Intravascular Ultrasound Patterns of Stent Fracture. Am J Cardiol 2009;103:818-23. 39. Chakravarty T, White AJ, Buch M, Naik H, Doctor N, Schapira J, et al. Meta-analysis of incidence, clinical characteristics and implications of stent fracture. Am J Cardiol 2010;106:1075-80. 40. Windecker S, Remondino A, Eberli FR, Jüni P, Räber L, Wenaweser P, et al. Sirolimus-eluting and paclitaxel-eluting stents for coronary revascularization. N Engl J Med 2005;353:653-62. 41. Dibra A, Kastrati A, Mehilli J, Pache J, Schühlen H, von Beckerath N, et al. ISAR-DIABETES Study Investigators. Paclitaxel-eluting or sirolimus-eluting stents to prevent restenosis in diabetic patients. N Engl J Med 2005;353:663-70. 42. Kandzari DE, Rao SV, Moses JW, Dzavik V, Strauss BH, Kutryk MJ, et al. Clinical and angiographic outcomes with sirolimus-eluting stents in total coronary occlusions: The across/tosca-4 (approaches to chronic occlusions with sirolimus-eluting stents/total occlusion study of coronary arteries-4) trial. JACC Cardiovasc Interv 2009;2:97-110. 43. Halkin A, Carlier S, Leon MB. Late incomplete lesion coverage following Cypher stent deployment for diffuse right coronary artery stenosis. Heart 2004;90:e45. 44. Marrey RV, Burgermeister R, Grishaber RB, Ritchie RO. Fatigue and life prediction for cobalt-chromium stents: A fracture mechanics analysis. Biomaterials 2006;27:1988-2000. 45. Sanchez CE, Cilingiroglu M, Leesar MA, Costea A. Biventricular pacing leading to coronary stent fracture. Tex Heart Inst J 2011;38:208-9. 46. Hoshi T, Sato A, Nishina H, Kakefuda Y, Noguchi Y, Aonuma K. Fatal ostial right coronary artery coronary stent fracture and perforation induced by mechanical stress between the Sternum and dilated aortic root. Circulation 2011;123:1679-82. 47. Tandar A, Whisenant BK, Michaels AD. 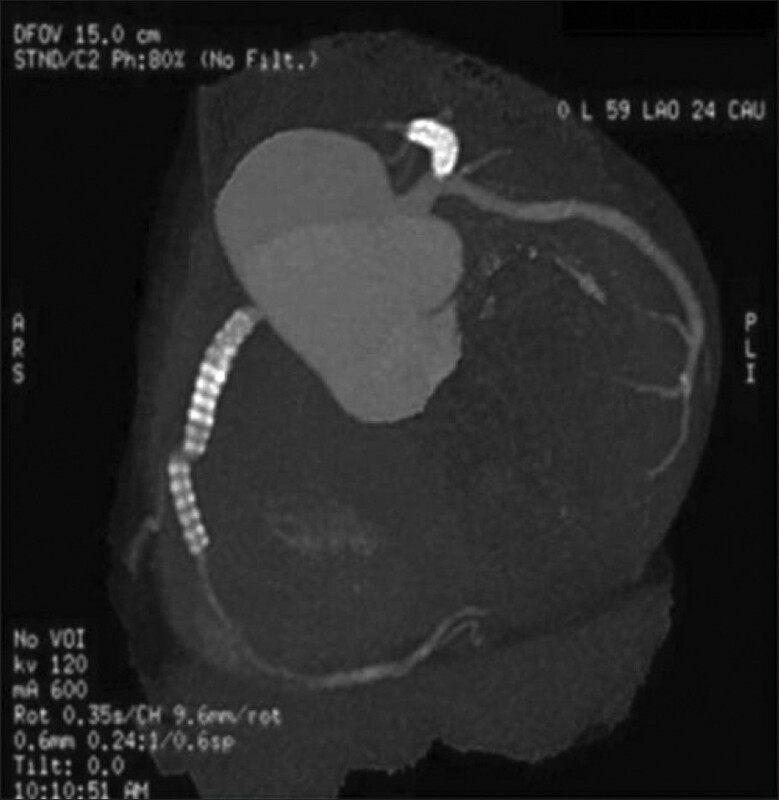 Stent fracture following stenting of a myocardial bridge: Report of two cases. Catheter Cardiovasc Interv 2008;71:191-6. 48. Park KW, Park JJ, Chae IH, Seo JB, Yang HM, Lee HY, et al. Clinical Characteristics of Coronary Drug-Eluting Stent Fracture: Insights from a Two-Center DES Registry. J Korean Med Sci 2011;26:53-8. 49. Park JS, Shin DG, Kim YJ, Hong GR, Cho IH. Acute myocardial infarction as a consequence of stent fracture and plaque rupture after sirolimus-eluting stent implantation. Int J Cardiol 2009;134:e79-81. 50. Makaryus AN, Lefkowitz L, Lee ADK. Coronary artery stent fracture. Int J Cardiovasc Imaging 2007;23:305-9. 51. Kang WY, Kim W, Hwang SH, Kim W. Dark side of drug-eluting stent: Multiple stent fractures and sudden death. Int J Cardiol 2009;132:e125-7. 52. Chhatriwalla AK, Cam A, Unzek S, Bhatt DL, Raymond RE, Lincoff AM. Drug eluting stent fracture and acute coronary syndrome. Cardiovasc Revasc Med 2009;10:166-71. 53. Khanna R, Kapoor A, Sinha N. Acute ST-Elevation myocardial infarction 6 Years following a sirolimus-eluting stent secondary to complete stent fracture. J Invasive Cardiol 2012;24:E64-6. 54. Lousinha A, Fiarresga A, Cardona L, Lopes JP, Lopes A, Cacela D, et al. Stent fracture: Case report and literature review. Rev Port Cardiol 2011;30:213-21. 55. Ino Y, Toyoda Y, Tanaka A, Ishii S, Kusuyama Y, Kubo T, et al. Serial angiographic findings and prognosis of stent fracture site without early restenosis after sirolimus-eluting stent implantation. Am Heart J 2010;160:775.e1-9. 56. Vaknin-Assa H, Assali A, Fuchs S, Kornowski R. An unusual cluster of complications following drug-eluted stenting: Stent fracture, peri-stent aneurysm and late thrombosis. Isr Med Assoc J 2007;9:331-2. 57. Okamura T, Hiro T, Fujii T, Yamada J, Fukumoto Y, Hashimoto G, et al. Late giant coronary aneurysm associated with a fracture of sirolimus eluting stent: A case report. J Cardiol 2008;51:74-9. 58. Kim SH, Kim HJ, Han SW, Jung SM, Kim JS, Chee HK, et al. A fractured sirolimus-eluting stent with a coronary aneurysm. Ann Thorac Surg 2009;88:664-5. 59. Stabile E, Escolar E, Weigold G, Weissman NJ, Satler LF, Pichard AD, et al. Marked malapposition and aneurysm formation after sirolimus-eluting coronary stent implantation. Circulation 2004;110:47-8. 60. Nebeker JR, Virmani R, Bennett CL, Hoffman JM, Samore MH, Alvarez J, et al. Hypersensitivity cases associated with drug-eluting coronary stents: A review of available cases from the Research on Adverse Drug Events and Reports (RADAR) project. J Am Coll Cardiol 2006;47:175-81. 61. Siqueira DA, Abizaid AA, Costa J de R, Feres F, Mattos LA, Staico R, et al. Late incomplete apposition after drug-eluting stent implantation: Incidence and potential for adverse clinical outcomes. Eur Heart J 2007;28:1304-9. 62. Loke KS, Loi HY, Goh AS, Ng DC. Pseudoaneurysm and Coronary Abscess Secondary to Coronary Stent Fracture Identified With Tc-99m Hexamethylpropyleneamine Oxime-Labeled White Blood Cell SPECT/CT Scintigraphy. Clin Nucl Med 2011;36:397-9. 63. Stribling WK, Prinz AW, Topaz O, Khan R, Gentili A, Jovin IS. Bypass graft stent fracture leading to saphenous vein graft pseudoaneurysm. Circulation 2010;122:e476-7. 64. Vik-Mo H, Wiseth R, Hegbom K. Coronary aneurysm after implantation of a paclitaxel-eluting stent. Scand Cardiovasc J 2004;38:349-52. 65. Park CS, Kim PJ, Park HJ, Jang SW, Jung HO, Kim HY, et al. A serial ultrasound assessment of neoaneurysm following paclitaxel-eluting stent implantation. Int J Cardiol 2007;123(Suppl):e21-2. 66. Yamen E, Brieger D, Kritharides L, Saw W, Lowe HC. Late incomplete apposition and coronary artery aneurysm formation following paclitaxel-eluting stent deployment: Does size matter? J Invasive Cardiol 2007;19:449-50. 67. Yamada KP, Koizumi T, Yamaguchi H, Kaneda H, Bonneau HN, Honda Y, et al. Serial angiographic and intravascular ultrasound analysis of late stent strut fracture of sirolimus-eluting stents in native coronary arteries. Int J Cardiol 2008;130:255-9. 68. Koolen JJ, van het Veer M, Hanekamp CE. Stent Boost image enhancement: First clinical experience. Medicamundi 2005. Available from: http://www.healthcare.philips.com/pwc_hc/main/about/assets/Docs/medicamundi/mm_vol49_ no2/MM_49-2_03_Koolen.pdf [Last cited on 2011 Nov 18]. 69. Schoonenberg G, Lelong P, Florent R, Wink O, ter Haar Romeny B. The effect of automated marker detection on in vivo volumetric stent reconstruction. Med Image Comput Comput Assist Interv 2008;11:87-94. 70. Lindeberg T. Feature detection with automatic scale selection. Int J Comput Vision 1998;30:79-116. 71. 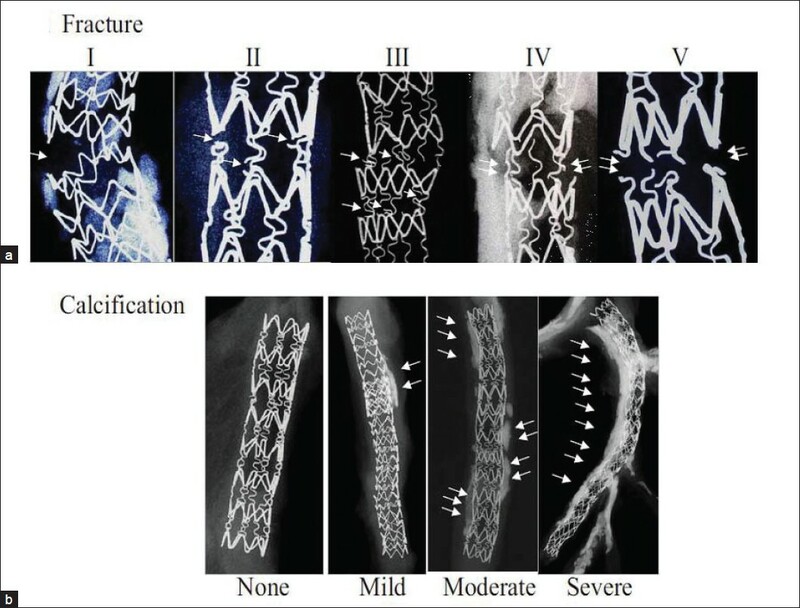 Mitsutake R, Miura S, Nishikawa H, Saku K. Usefulness of the evaluation of stent fracture by 64-multi-detector row computed tomography. J Cardiol 2008;51:135-8. 72. Sozzi FB, Civaia F, Rossi P, Rusek S, Dor V. Coronary stent fracture and in-stent restenosis at coronary computed tomography. J Am Coll Cardiol 2009;54:2199. 73. Li P, Gai L. Coronary stent fracture detected by multidetector computed tomography. Int J Cardiovasc Imaging 2010;26:729-30. 74. Lim HB, Hur G, Kim SY, Kim YH, Kwon SU, Lee WR, et al. Coronary stent fracture: Detection with 64-section multidetector CT angiography in patients and in vitro. Radiology 2008;249:810-9. 75. Pang JH, Kim D, Beohar N, Meyers SN, Lloyd-Jones D, Yaghmai V. Detection of stent fractures: A comparison of 64-slice CT, conventional cine-angiography, and intravascular ultrasonography. Acad Radiol 2009;16:412-7. 76. Hecht HS, Polena S, Jelnin V, Jimenez M, Bhatti T, Parikh M, et al. Stent gap by 64-detector computed tomographic angiography relationship to in-stent restenosis, fracture, and overlap failure. J Am Coll Cardiol 2009;54:1949-59. 77. Kashiwagi M, Tanaka A, Kitabata H, Ino Y, Tsujioka H, Komukai K, et al. OCT-Verified neointimal hyperplasia is increased at fracture site in drug-eluting stents. JACC Cardivasc Imaging 2010;5:230-6.